Below, you'll find an attached list of in depth suggestions of obtaining the original BGM, and getting better voice acting. 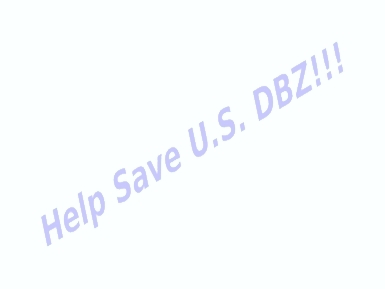 We will send this to FUNimation along with the petition. Toei licences Funimation to print the original Japanese DBZ to video. Furthermore, they agree to allow Funimation to use the original BGM in any and all English dubs in perpetuity, so long as the contract remains active. While payment and distribution options are quite free and interchangeable here, one generic solution that we have worked out is for Funimation to pay any additional production costs of these new tapes, for Toei to pay shipping costs of the tapes from Funimation's chosen production facility to any locations wishing to carry DragonBall Z in raw Japanese (if the tapes are produced in Japan, with Funimation paying only the mass-production cost, this may be an even more feasible solution), Toei pays Funimation a percentage of profit per raw Japanese tape sold. This solution allows each company to work hand in hand to bring DragonBall Z, in it's true form, to English-speaking and Japanese fans alike to own. In addition, both Funimation and Toei will agree to sell the tapes at the SAME COST on the dollar, thus insuring that fans in one country don't turn to buying the other country's tapes just because they're a few dollars cheaper. Toei puts an end to this confusing part of the contract by simply producing and selling the original Japanese episodes on tape, thus rendering that section of the original contract null and void, and giving Funimation full rights to finally use the original BGM track that the series was meant to be shown in. This compromise, while certainly much more straightforward, seems less "friendly" to both companies than Case 1, in our opinion, and it already seems like something Toei has probably shot down previously, however, there's always the possibility it hasn't been considered yet. While some VERY hard-core fans may be opposed to this idea, it would probably be best, and would probably ease negotiations more, if Funimation agreed to use Kageyema Hironobu's English versions of his original theme songs and other in-show BGM, rather than the original Japanese versions. Note however, these songs should still be the same songs preformed by the SAME artist, as English versions of several (if not all) of his songs already exist, preformed by him. This plan would involve recasting voice actors from scratch, and while the casting issue may be made slightly more complicated than it is now, it should result in superior results with voices. Funimation will conduct standard voice-acting primary auditions as usual, with one exception: One of those working on selections for actors MUST be extensively familiar with, and show that they have a deep understanding for and of the original cast of actors in Japan. After primary auditions, the voice director will seek the opinions of the ORIGINAL voice director, voice cast, and possibly even Akira Toriyama himself, before proceeding further. Selections of voice actors will be made according to the pooled knowledge and opinions of all these people, and since the original directors and cast would be involved, the new actors would surely be perfect. Finally, hiring of those who fit the voice bill well, but don't act well, will be discouraged. Actors MUST be able to accurately portray emotions like the original characters, pronounce Japanese terms and attacks flawlessly, etc. Acting ability is, in many ways, MORE important than just the sound of a given character's actor's voice. Of course, Plan One is clearly more intensive than normal procedure, and involves the participation of more people. As such, there is the possibility that it will not be effective without a certain kind of VERY precise management on both sides. That's why Plan Two is here; simply, in case Plan One is simply not feasible. With Plan Two, Funimation would go back to the Ocean Group for a voice cast. While they were controversial, they were still very good voice actors, and with small adjustments, their flaws as they relate to DragonBall Z could be worked out easily. Many characters being voiced by the original Ocean cast where acceptable, and, in some cases, quite superb. They had their own strengths and weaknesses when compared with their characters' original voices, and some of them simply needed a slight "tune-up" to work out a few of those problems. These voices include the Ocean Group NA voices of Son Goku, Vegeta, and Bulma. Vegeta generated a great deal of anger originally, but much of it now, in retrospect, seems unwarrented. That is why, again, with fine tuning, Brian Drummond could probably resume his work as Vegeta, and sound even BETTER, and closer to perfection, than his earlier attempts. During his career as Vegeta, Brian Drummond tried two slightly different types of voices for Vegeta. His first voice, which he used during the Saiyajin Saga (and will henceforth be referred to as NA Vegeta Revision 1) was crisper and had a more "cool" sound to it than his second (which will be referred to as NA Vegeta Revision 2), but it also seemed somehow lacking in more important areas. Thankfully, Brian noticed this before the end of his career and began working to correct it. This work was apparently continued when he began voicing Zechs Marquise/Miliardo Peacecraft on the English dub of New Mobile Report Gundam Wing, as the gradual change can be seen there, from where he was as Vegeta, to where he is today, as Zechs. The major beef most fans seemed to have with NA Vegeta Revision 1 was that it didn't sound "male" enough, almost to the point of sounding androgenous. This is not to say that more bass for the voice is invariably better. The voice Brian used for Zechs in later episodes of Gundam Wing (near the end, in fact) is probably TOO bass, and as such, the best voice for him to do for Vegeta would probably be somewhere in-between the end result of NA Vegeta Revision 2, and Zech's final voice. Another issue that fans had with NA Vegeta Revision 1 was that the voice sounded a bit too forced, but, the above voice suggestion could probably cover this as well (you will notice that Brian's final voice for Zechs hardly sounds forced at all, which is a VERY big plus). Of course, one thing Brian need not change much, if at all, was the way he screamed or portrayed rage as Vegeta. It was on par with his original voice all most all the time, and just as impressive. Bulma only requires slight adjustment from Lalaina Lindbjerg's original rendition. The only thing that really needs to be changed is for the voice to be given a quality that sounds less prone to complaint (despite the fact that Bulma is a terrible complainer anyway). The above are all examples of Ocean Group cast members who only must make small adjustments to make their voices work well for their characters, but sadly, several voices in the group's original cast simply require more major of a change. These include Kame-Sennin (Muten-Roshi), Guuyanomayo, Kaio-sama, Krillin, Gohan, and, should you re-dub older episodes to weed out all the terrible censoring forced by Saban, and the earlier, bad voice-selection choices, Furiiza. Kame-sennin would be easy enough to fix. His voice simply needs to be less screechy. Getting an actual old man to voice him would probably be a good idea (an example of a good NA DBZ voice actor for an old man is Dr. Kochin, again from "The World's Strongest"). Guuyanomayo (Ox King), while having a voice that fit his appearence, could probably benefit from some new casting as well. Dave Ward's Kaio-sama is another example of a character whose voice mostly fit his opinion, but just sounded totally wrong for one reason or another (in this case, because Dave made him sound like too much of a foolish fat old man). Kaio should have a wiser-sounding voice, like that of a wise but heavy-set martial arts master, and Dave's voice did not fit the bill. Of course, if Mr. Ward were to do a voice more like his voice for Dr. J in Gundam Wing, he may prove to be able to take over the role anyway. The only major problem with Terry Klassen's Krillin was that he made him sound like a bumbling, 30-year old incompetant, whereas his original voice made him sound like a bumbling, 12-year old incompetant who could still retain his dignity. Perhaps Terry Klassen could just adjust his voice a bit, or perhaps he'd still have to be totally replaced. That's mostly your decision. Also, he seemed to have a minor problem with acting out certain emotional scenes (such as Yamcha's death during the Saiyajin saga...something about Terry's acting there was all wrong), but we suspect this could be very easily fixed by him. Gohan, quite simply, needs a voice that fits his age. Not an overacting woman whose "little boy rendition" sounds 8-12, but rather, one who sounds 4-6 (initially), perhaps even an actual child. Furiiza's voice is another example of a VERY easy fix. Furiiza is just one of those few characters for whom an identical mimic of his Japanese voice would work perfectly, despite the differences in language: A demonic, male alien. Any other voices not mentioned here, from the Ocean Group, would be mostly fine how they were. But, the actors should be encouraged to watch the original Japanese episodes, so that they can make voice and acting adjustments that they deem necessary to better emulate English versions of each character, and thus, improve their acting for each character they voice. Remember, Funimation, if blending both Voice Acting Plan One and Voice Acting Plan Two is a possibility, then it would probably be a VERY good idea. Not only would the results be invariably better, but it would give fans closure. We feel that, if the Ocean Group was guided by the original cast and voice directors, their renditions of the myriad of characters in DBZ could be perfect. Voice Actor suggestion sheet coming soon!...heh, sometime anyway. It's basically done.